Would you like to have an access to an unlimited amount of mobile device apps right under your fingertips? BringMeApps toolbar promises to give you that kind of access, but there is a catch to it. This browser plug-in could be associated to unreliable third parties or even worse – it is possible for BringMeApps toolbar to get exploited by cyber crooks to distribute corrupted content. Therefore, even though the application seems to be a reliable and useful product, you ought to remove BringMeApps toolbar from the system as soon as possible, if you want to avoid any potential threats. The problem with such browser extensions is that users often download and install the likes of BringMeApps toolbar onto their computers willingly. After all, BringMeApps toolbar is created by MindSpark which offers an elaborate uninstall manual on its support page, and it makes an impression that nothing bad could come out of this application. Nevertheless, users have reported having problems with all of the BringMeApps toolbar’s predecessors, including CitySearch Toolbar, ButterflyField Toolbar, ConservativeTalkNow Toolbar and many others. Consequently, the same issues can be applied to BringMeApps toolbar as well. Whether you download the application at bringmeapps.com, Google App Store, or any other third party file hosting web page, you need to be sure to read the installation wizard carefully. 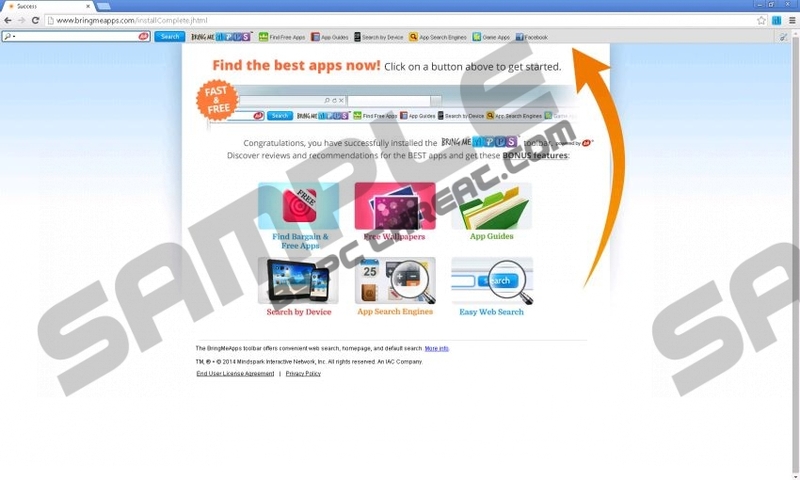 Users often get the impression that BringMeApps toolbar hijacks their browsers by modifying homepage and default search engine. However, that is not exactly true. BringMeApps toolbar is promoted as a tool that is powered by Ask. As a result, the browser settings modification is part of the extension’s setup. Unless you opt out during the installation, home.tb.ask.com will definitely be set as your default homepage. The point is that BringMeApps toolbar definitely INFORMS you about the oncoming modification and you can choose whether you want your homepage changed or not. It is important to understand that BringMeApps toolbar is not a computer virus. After all, disregarding the exact way of distribution, you installed the application on the system yourself. BringMeApps toolbar does not intend to infect you with malware as well, BUT such possibility remains, as we can never be sure what websites you might be redirected to if you use the toolbar or the Ask Search engine. Keep in mind, that Ask.com has left the search engine business back in 2010, so it is not exactly clear why a toolbar is making use of an outdated search engine. To remove BringMeApps toolbar the application and make sure that your computer is fully protected against any potential threats; uninstall the extension via Control Panel first. Then restore your browser settings and scan the PC with SpyHunter free scanner. A full system scan will help you see whether there are any other potentially unwanted applications installed on the computer, and you will be able to remove them on the spot. Go to Uninstall a program and remove BringMeApps toolbar. Click Uninstall a program and remove BringMeApps toolbar. Select Add or remove program and uninstall BringMeApps toolbar. Select Search providers on the left. Set a new default search engine, remove Ask Search and click Close. Under General tab click Use Default button and press OK.
Click search engine icon on the left of the search box (top right corner). Select Manage search engines on drop-down menu. Remove Ask Search from the list and click OK.
Press Firefox button and go to Options. Under General tab click Restore to Default button and click OK.
Press Firefox button again and select Add-ons. Disable and remove BringMeApps from Extensions. Press Alt+F and go to Tools. Click Extensions. Remove BringMeApps from the list and click Settings on the left. Select Open a specific page or set of pages under On Startup. Click Set pages and change your startup page address. Click OK.
Press Manage search engines button under Search. Set a new default search engine; delete Ask Search and press Done. Quick & tested solution for BringMeApps toolbar removal.